Geek Lit Etc. : The deep web has never been so deep. The deep web has never been so deep. Alif is a cypher. The first letter of the Arabic alphabet, it is a single vertical line. A simple name for a person whose life takes place in the shadows between computers. 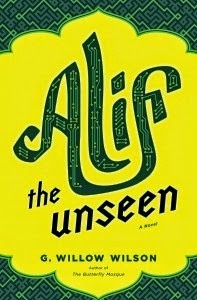 In G. Willow Wilson's Alif the Unseen, Alif's life is turned upside-down, in more ways than one. Alif lives in a pre-Arab Spring country somewhere in the Middle East. The censors have become more and more a part of the online life of the country, and Alif and his online comrades do their best to provide free movement of information to their clients. It means that The Hand could come down on him at any time, but with the confidence of youth he doesn't really believe that it would happen to him. As it often does, Alif's problems start with a girl. Intisar is Alif's first love, a Muslim girl from a good family. He meets her online, on some of the message boards that the educated, free-thinkers tend to inhabit. Hardly a radical, she's as likely to defend the government as she is to question it. The computer world gives her the freedom to speak her mind in a way that her birth and culture do not, and Alif is absolutely smitten. They even go so far as to draw up a their own marriage contract, and while Alif's mother is away visiting her family he is able to have her over unchaperoned. But a woman of her standing is hardly going to have the future she expects with the poor son of a second wife. When the reality of doing her own laundry settles in, she takes the easy route and accepts the husband that her father has found for her. Heartbroken, Alif decides to disappear from Intisar's life. So he proceeds to do so. Since the majority of his life is spent online, he creates a program to track her, and make sure that whatever she does, she will never see his online presence again. Whether she changes usernames, or computers, or uses a VPN, this program will track her by her word usage and typing styles, and remove Alif's presence. Such a complex program would, by its very existence, draw the attention of a few very influential people. And when Alif finds himself in the possession of The Thousand and One Days, he ends up with more problems than just The Hand. G. Willow Wilson shines in her first long-form novel, masterfully weaving together the modern day with the ancient, religion with mythology, and love with loss. Highs: The character of Dina is perhaps the most three-dimensional, honest females in recent fantasy fiction. Lows: As with much fiction set in the middle east, as current events unfold the story may show its age quickly. Verdict: Winner of the 2013 World Fantasy Award, Alif the Unseen is a must-read for fans of fantasy and world fiction alike.